This week's edition will see us not only travel to three different promotions but two countries as we head firstly to Livingston in Scotland on Saturday. Then it's to England's Hull before ending the weekend back north of the border in Glasgow, Scotland. Let's get Ready For The Weekend! Saturday night sees the wrestling weekend start with Reckless Intent Wrestling holding their The Way It Is event at the Murieston Scout Hall in Livingston. While Reckless Intent continues to grow as a promotion, this Saturday will mark the end of either Chris Renfrew or Sean Mercer's time with the company when they face in a Loser Leaves Reckless Intent match. These two men were originally scheduled to compete in standard match until Renfrew caught Mercer bullying members of the roster at a recent event. Following the incident, Renfrew challenged Mercer to the match. These men don't like each other and after Saturday, they'll not be sharing a locker room in Reckless Intent anymore. Back in May, Massimo suffered an injury which lead to him being unable to defend the UK Championship. Now prior to this injury, DCT was due a championship match with Massimo. Obviously this wasn't able to take place. However, last month, Massimo returned from that injury and defeated the interim champion, Grado to reclaim the championship he never lost. Now he has to defend the UK Championship against the man who never got his chance, DCT. This is a match that has been waiting to happen for over 4 months. Massimo wants to keep the championship he has only just reclaimed and DCT wants to continue the roll he has been on while waiting for his opportunity. Saturday shall see the debut of “The Real Deal” Mark Coffey in Reckless Intent and he's aiming for the top of his first night as he'll be challenging Michael Chase for the Heavyweight Championship. Chase is the only four-time Heavyweight Champion with his latest reign beginning with a win over “The Beast Of Belfast” Big Damo. Coffey needs little to no introduction as one half of Polo Promotions and a multiple tag team and singles champion. Chase has faced all comers during his championship reigns and Coffey is as big as they will come and will be looking to add another championship to his impressive history. Moving on to Saturday and New Generation Wrestling are at the Hull City Hall with Regeneration-X. The show will feature the first ladder match for the GenX Championship with the current champion Matt Myers, Bubblegum, Wild Boar and the winner of Martin Kirby vs Robbie X. Not only will the winner of this match walk away with the GenX Championship but an opportunity at the Undisputed Championship, as well. Myers finally won the championship from Bubblegum in July at 8th Anniversary Show and will look to keep the title as well as getting a step closer to the Undisputed Championship but the odds in this match are not in his favour. He'll need all the determination he used to win the championship to keep it this Saturday. “The Mexican Sensation” El Ligero has been in a long standing war with Dara Diablo in NGW which finally ended in a Last Man Standing match at 8th Anniversary Show. Ligero must have felt that the skies were clearing until Joseph Conners appeared. After attacking Ligero, “The Mexican Sensation” is after some retribution and a match between the two has been signed for this Saturday. This is mostly likely the exact plan that Conners has in mind as he has a way of manipulating things to his own way. Ligero will be out for revenge but he must be aware of Conners' demanding offence, both physically and mentally. The main event this Saturday will see “The Showstealer” Nathan Cruz defend the Undisputed Championship against the Destiny Rumble winner, Doug Williams. While Cruz is one of the biggest stars not only in NGW but British Wrestling as a whole, Williams is a legend of British Wrestling. Having won championships on almost every continent, Williams still has his eyes on more championship gold. Notably, the gold around the waist of Cruz. While “The Showstealer” played a part in eliminating The Control from NGW and has fought every challenger put his way, he shall know that Williams' experience and skill is matched by very few. A main event where a pioneer of British Wrestling faces one of it's brightest stars with championship gold on the line. “The Amazing” Matt Myers (c) vs Bubblegum vs Wild Boar vs ??? 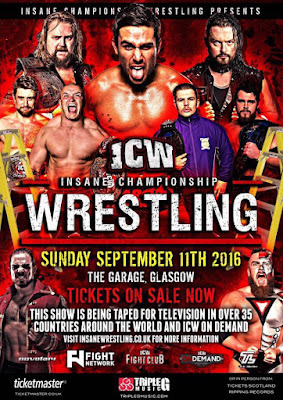 Finally on Sunday we head back to Scotland for Insane Championship Wrestling's Fight Club TV taping in Glasgow. The event shall be the last for Noam Dar who will soon be joining WWE's RAW show as part of their Cruiserweight division. While Dar will be moving on to new things, his last match will be something of a step back into history as he faces Andy Wild. These two men have competed against each other for years. They started their journey in wrestling at the same time. Now for the time being they give us one last hurrah. Have no doubt that these two men are going to give the best performance they can together. 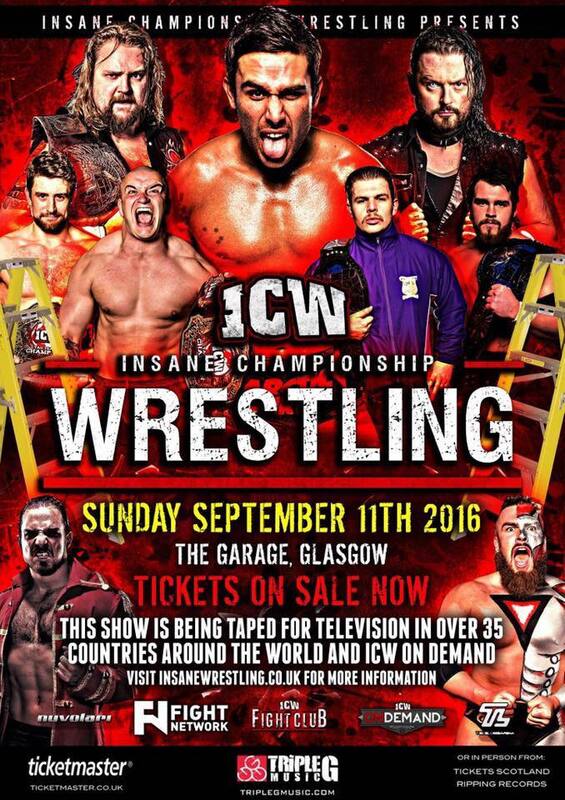 There are no issues and no rivalries here, this is purely competition and a celebration of Noam Dar's time in ICW. While Noam Dar will be heading to WWE, Joe Coffey shall be facing a 4 time WWE World Champion on November 20th when he competes against Kurt Angle. Before he gets there though, he's got a match this Sunday against the current EVOLVE Champion, Timothy Thatcher. Coffey is known as a mighty wrestler and rightly so and his opponent, Thatcher, is known as being as pure a wrestler as you can get. Both men are genuine heavyweights and their styles should marry together very well. While Coffey will be focused on Angle on November 20th, he'll know that Thatcher is as much of a challenge and likewise Thatcher will know the reputation that Coffey holds. Back at BarraMania II in April, Polo Promotions (Jackie Polo & Mark Coffey) won the Tag Team Championship, but then left the promotion. Not long after ICW began a tag team tournament to crown new champions with The Local Fire (Davey Boy & Joe Hendry) eventually winning at Shug's Hoose Party III in July. However, immediately following their win, Polo Promotions appeared with the original Tag Team Championship belts. This left a predicament as while Local Fire had won the tournament, Polo Promotions had never lost the championship. Therefore, this Sunday, Polo and Coffey of Polo Promotions will face Boy and Hendry of Local Fire in a ladder match with the winning team being named the Unified Tag Team Champions. Not only will the winning team be crowned the unified champions but they will also go on to Fear & Loathing IX on November 20th to face 6 time [WWE] World Tag Team Champions Team 3D's Bubba Ray & D-Von Dudley. It's all on the line this Sunday and only one team is walking away with it all.